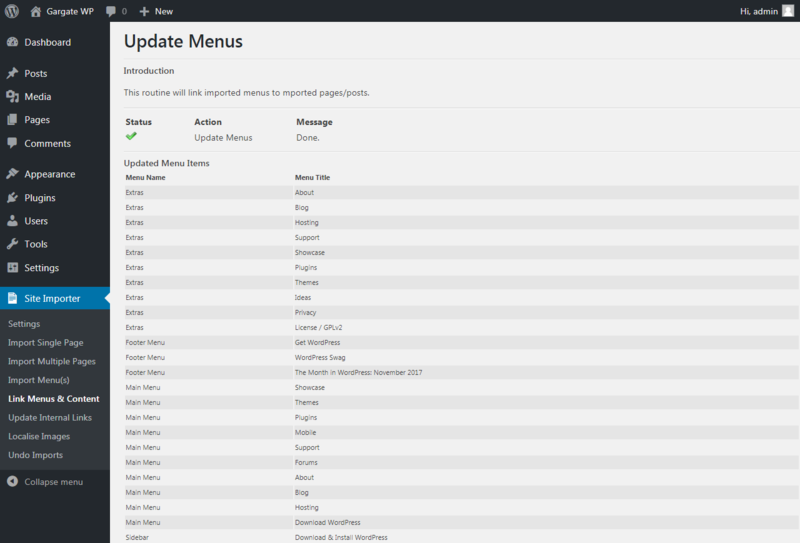 When you import a WordPress menu using WP Site Importer, the physical menu structure is automatically created for you. However, the menu item links will initially still point to the original source website. The Link Menus to Content feature automatically updates the menus you have imported. It locates any content imported from the location to which the menu item currently points. It then automatically changes the custom menu item link into a proper internal Page or Post type link and updates the link to point to the internal Page or Post. This means that at the end of the process your menus will be fully operational. There are no configuration parameters applicable to this process. The update will be triggered as soon as you choose the menu option. A summary of the results, highlighting which menu items have been switched and any that have been skipped. Menu items will be skipped if they do not point to content that has been imported. You can re-run this option at any time. Any menu items that had already been converted will be highlighted in the results summary.